Previous weekend, my husband and I traveled to Slovenia to attend a wedding of our dear friends. The wedding was held in the north-eastern part of Slovenia in a region between rivers Drava and Mura called Prlekija. The traditions in this area are still very much alive and our friends got married in a traditional way. Following the tradition, the bride’s guests gathered at her home. The groom’s party should gather at his home, but as he’s not from the region that wasn’t possible, so we’ve gathered at the place where the wedding reception was held later in the day. We’ve accompanied the groom to the bride’s house. There he was asked to participate in some games. For instance, he had to learn the traditional dance and there was a improvised market and he had to pick the products his bride would chose. 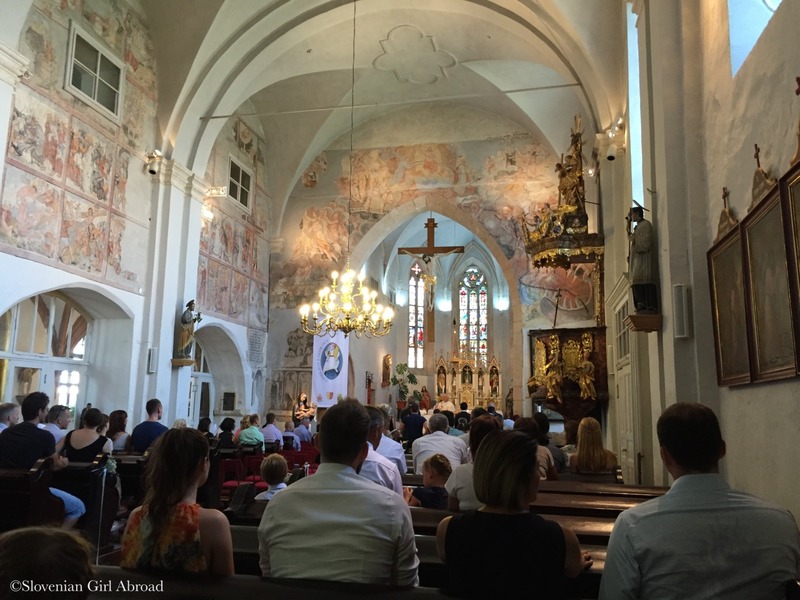 After the games, his bride appeared and the whole wedding procession moved to Ormož, where the church wedding was held. But before we left bride’s home-village, a male relatives of the bride together with some local guys put up the obstacle – wedding tollgate called “šranga”. Traditionally, there the groom would have to prove them he’s manly enough to marry the girl from their village. They would also collect money from the groom either in recompense for taking the bride from the village or to collect money for the bride’s dowry. 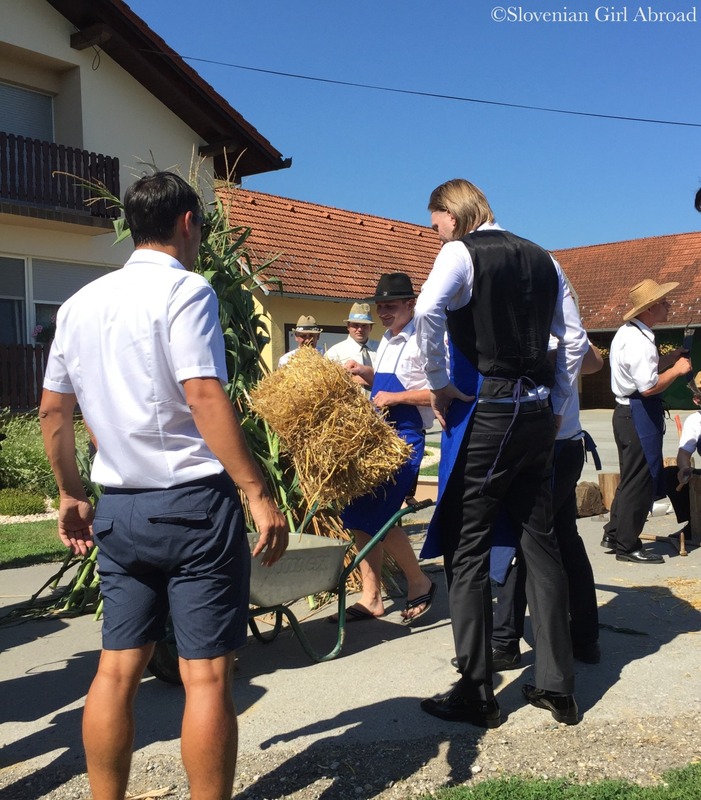 Our groom had to complete some tasks: he had to carry the hay bales, sew the log and mow the grass in an old traditional way with the scythe. After he had successfully completed his duties, he and his best man “bargained” for the bride. When they agreed to pay symbolical sum, he received blessing to marry the bride. 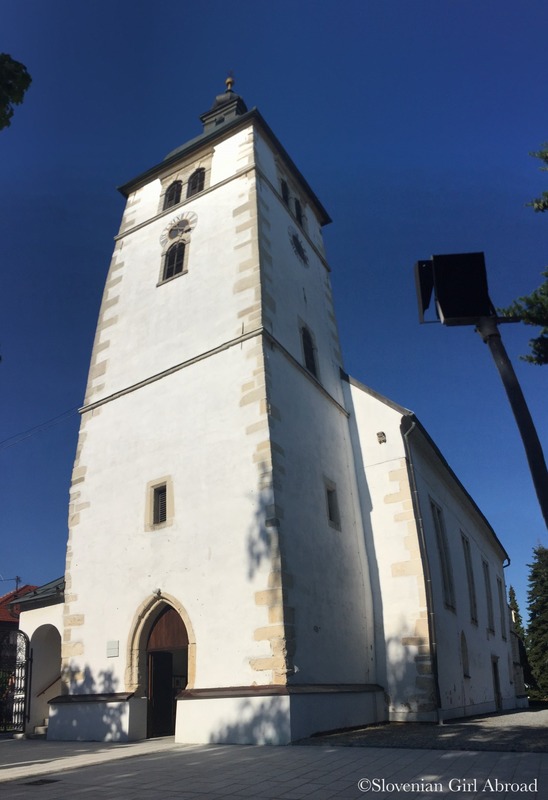 After the šranga, we’d continued our way towards the town Ormož where bride and groom got married in the lovely church of St. Jacob. The Slovenian law doesn’t recognise church wedding as legal. Therefore, the couples who wish to be married legally and spiritually, must have two wedding ceremonies: one performed by the government officials and the second performed by the priest. According to the traditions both ceremonies should be held at the same day, but our friends got married in the registry office a day before, so we’ve witnessed only the church wedding ceremony. After the wedding ceremony in the church, the whole wedding party returned to the restaurant nearby where the party started. It involved a lot of eating, drinking and dancing. We had a lot of fun. Some of the traditions are similar to Chinese weddings here. I was about to say the same thing. I was in a Hong Kong wedding. The groom also plays games and he has to pay the bridesmaids money for his bride. I didn’t know til later that we actually get to keep the money. The part where the groom has to play games or complete so e crazy challenges, and bargain for the bride. In Singapore there also 2 weddings, the official ceremony and the traditional one. So either the wedding combines both or separately. I love such traditions and I think it’s great they still keep them! Especially weddings are such a fun event! 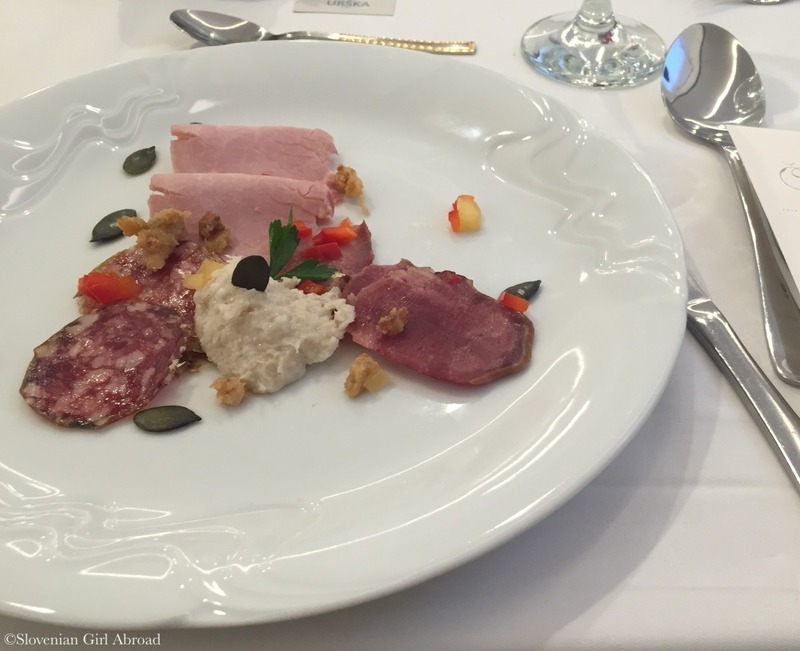 Some of the best meat products of our country on that plate! Great insight of your traditions at a wedding! Traditions are so important to keep in my opinion. I agree. Although, my wedding was not traditional at all (I didn’t see myself in the role of traditional bride), I am happy to see there are still couples who are keeping wedding traditions alive. This is so nice to learn about other traditions 🙂 The food looks very tasty ! Very interesting to read about these traditions, and the church looks beautiful! Great post really interesting !!! !